North Korea has refused to deny involvement in a cyber-attack on Sony Pictures that came ahead of the release of a film about leader Kim Jong-un. 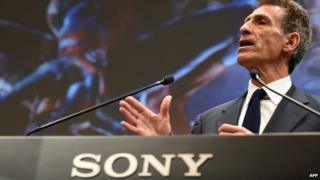 Sony is investigating after its computers were attacked and unreleased films made available on the internet. When asked if it was involved in the attack a spokesman for the North Korean government replied: "Wait and see." In June, North Korea complained to the United Nations and the US over the comedy film The Interview. In the movie, Seth Rogen and James Franco play two reporters who are granted an audience with Kim Jong-un. The CIA then enlists the pair to assassinate him. North Korea described the film as an act of war and an "undisguised sponsoring of terrorism", and called on the US and the UN to block it. California-based Sony Pictures' computer system went down last week and hackers then published a number of as-yet unreleased films on online download sites. Among the titles is a remake of the classic film Annie, which is not due for release until 19 December. The film about North Korea does not appear to have been leaked. When asked about the cyber-attack, a spokesman for North Korea's UN mission said: "The hostile forces are relating everything to the DPRK (North Korea). I kindly advise you to just wait and see." On Monday, Sony Pictures said it had restored a number of important services that had to be shut down after the attack. It said it was working closely with law enforcement officials to investigate the matter but made no mention of North Korea. The FBI has confirmed that it is investigating. It has also warned other US businesses that unknown hackers have launched a cyber-attack with destructive malware.